Peppermint/Wx desktop - the Linux stealth weapon ! - background image : any windows background will do ! Please DO NOT used that for your day to day PM session or total shame on you. Re: Peppermint/Wx desktop - the Linux stealth weapon ! but it does not look real enough for me on Peppermint... I can't get the menu to change and I haven't worked out yet how to change the peppermint 6 logo on the menu. I haven't worked out yet how to change the peppermint 6 logo on the menu. To change the menu icon in the standard lxpanel just right-click on it and select "Menu" Settings where you then select the menu icon you wish to use. You are right, the PM menu does give away the "clone". Still a lot of windows users do not use it anyway so PM is good enough for me with the most useful program shortcuts (and the right icons) on the desktop. On the same subject, If you want a more convincing menu using that theme, Linux Mint Cinnamon come with an applet called "starkmenu" which mimic the windows 7 menu perfectly. 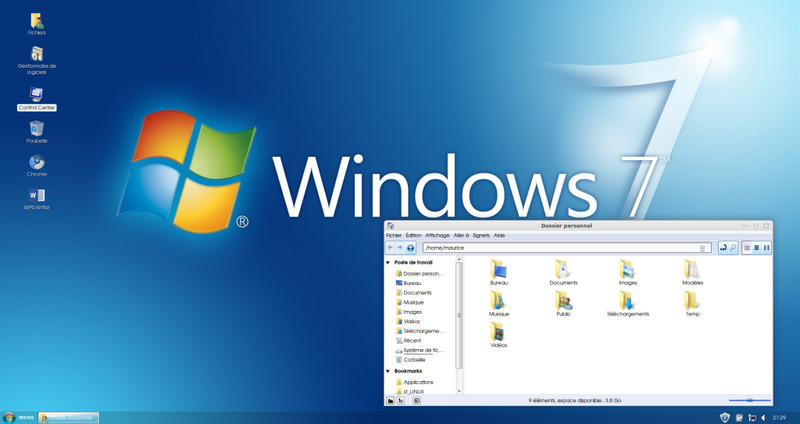 Also the desktop icons similar to windows come available directly with the system. 3. What's the point... Linux is Linux and Windows is Windows. When a user comes over to Linux why try to kid them its the same when it isn't. but wait... it is the same. It has a menu, it has a browser, it has a file manager, email, games blah, blah, blah. IT WORKS. That's all the average user needs to know and after a couple of weeks of using it I am sure they will know their way around. Not sure what to do.... Simply Ask!!! with a great user forum to come to and a little patience (more than I have) things will simply work out. I've never seen any benefit to distros like Zorin trying to emulate the Windows look .. it's not the skin that confuses new users, it's things like package management, file system layout, application names, etc. .. none of which Zorin can change. Linux is Linux .. if you try to fool someone into thinking it's like Windows you can GUARANTEE a bad experience .. they should be told (and understand) it's NOT Windows and why, then helped with the transition. At the end of the day, Linux will never be and has no intention of being Windows (thank god), if they expect it to be they're in for disappointment .. if on the other hand they EXPECT it to be different, they're much more likely to see its positives. Put a Windows skin on a Linux PC and anyone that sits at it will think "WTF, this PC is screwed up", so when you tell em it's Linux they're left with "Linux is screwed up"
I'm not even a fan of WINE for the same reasons. When I want to get nostalgic for Windows on a Linux machine, I install Q4OS, the Debian-derived distro with the Trinity desktop. But it's draw is not really that it looks a bit like XP, but that it offers Debian stability with easy codecs installation. It is fun, though, to press that start menu and see a Windows-familiar display. Well permit me to give my opinion on the subject. I repair computers for people and I know what they want. For Linux users, I agree, it make no sense to gave it a windows look. It's even repulsive. For the others who don't know what it is, I have tried to explain them the benefits and advantages of Linux, show them my desktop but in the end, you know how many want to have it ? zero, not one. There are too intimidated by the changes, look and do not want to spend time to learn another "OS" no matter how great it is. They want to see a steering wheel in a car not a joystick. So I made a Linux computer with the windows look and surprise, now they were listening. I made three so far. When they get to use it, they are way more lenient to accept the differences. After a while, showing them the real thing, they didn't mind at all dumping the windows look. They even find it fun. The thing is that we are trying to get more windows users to come on board. Still Linux is struggling on the desktop. But the more people we convince to take a look, whatever the means ( taping a steering wheel on a joystick ) the more we will attract also the best developers. That's what I am after (selfishness really). I agree with your point of view armageddon51. I also do the same thing with new users in start than they comfortable with that than I tell them the truth. And they ready to accept and they even find it fun. I think Windows Icon-set,font,themes with Linux Brand wallpaper. I don't mind to use it to convince new user but it should be good quality. Most of the time the package we found on the web, quality is not good it look cheap and Wallpaper is not matching with color schema. It will not going to be improve because most of Linux community are not convince with this idea or point of view and they don't want to be present them self look Copy-CAT. This is my personal opinion if somebody agree with It OK otherwise ignore it. I wonder if the Windows theme might actually discourage new users, like the "Uncanny Valley" in animation. It looks so close to being Windows but has noticeable off-putting differences.